Adobe Digital Editions is a great ereader to use as your default Windows program for .ePUB books. (1) Click here to go to Adobe’s Digital Editions download page. Go to the top of this window and look for the tab that says Download Adobe. Click on that tab, hold down your mouse button, drag the tab out of the window, and drop it on your desktop. Now you’ll have my instructions and Adobe’s pages both open in different windows. (2) Click on the link to download for Windows or for Macintosh, depending on your computer operating system. See Figure 1 where I’ve highlighted the link to download the Windows version. (3) When you click to download the application, you’ll either get a pop-up window similar to Figure 2, where you can click Save and Run, or you will be prompted to Save or Run (choose Save) and it will be saved in your default Save location. If you Save, then the file name should pop up in the bottom of the window and you can click on it to Run it. Figure 2. The window that may open when you click to download ADE. (4) Now, at any time you may get a pop-up window that asks if you want to allow this program to make changes to your computer, as in Figure 3. Say Yes. Figure 3. 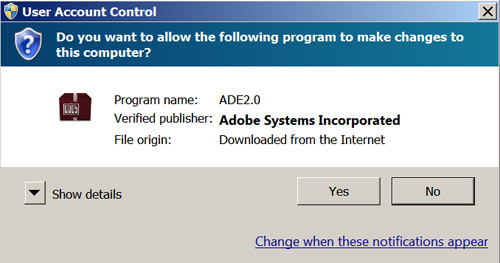 Windows User Account Control verification to allow a program to change your computer. (5) Once you have clicked Run or Install, you’ll see a License Notification. Click the Accept checkbox and then click Next. (6) Next a window will open telling you the default options that will be installed and that you can change them if you want. Just click Next. (7) Next the application will tell you the location where it plans to install. Click Next. (8) And finally, you’ll see a window where you can click Install. Wait until the application finishes and says it’s completed and click Close. 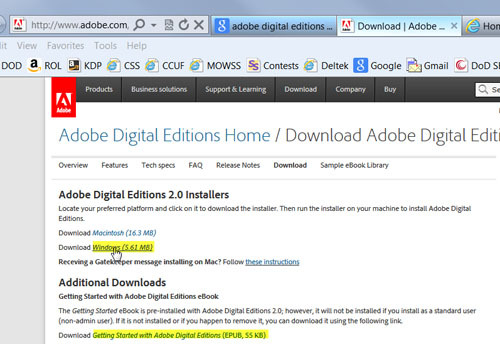 (9) Now go back to the link in #1 and click on the pdf document–Getting Started with Adobe Digital Editions–at the second highlighted link in Figure 1 to download it. When you open this pdf, it will open in ADE. Read it to learn how to organize your ADE library, how to save notes in your books, make bookmarks, search for text, transfer ebooks, etc.